In an unprecedented day of direct action against the fracking industry, activists from Reclaim the Power formed affinity groups to take action against thirteen different companies, government departments and frackademics who stand to profit from the extreme energy industry. Some details of the actions are below – photos are available here and for more details of all the actions listed below as well as other actions which took place today, head here. Why did we do this? Campaigners are working together to protect their homes and the environment after the Coalition Government announced that 60% of the UK would be opened up to fracking. The action has today been taken to put a stop to an industry which would further tie the UK into an unsustainable and unjust energy system which will propel us into catastrophic climate change and allowed over 30,000 people to die from fuel poverty last year. It also aims to highlight the need to create a democratic, community controlled energy system as an alternative to the Big Six’s corporate power. 2. Blockade at IGas HQ, London: At 8:30, there was a complete blockade of the headquarters of IGas Energy – one of the major fossil fuel exploration and production companies involved in fracking in the UK. IGas have been carrying out exploratory work for coalbed methane at Barton Moss near Salford, Greater Manchester, sparking huge resistance as well as brutal police repression of protesters. 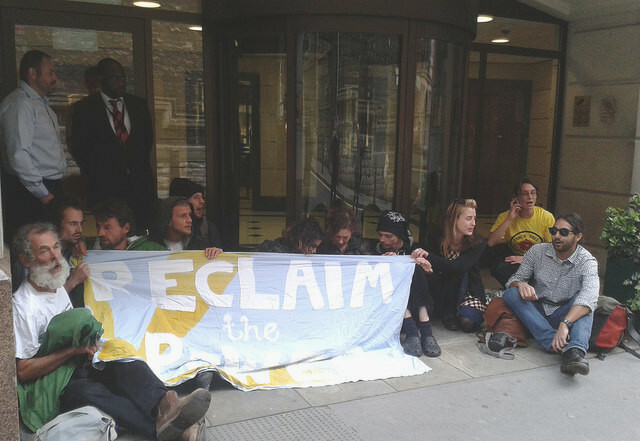 Both entrances of the headquarters were blocked by 15 activists holding a banner reading: ‘Reclaim the Power’. Onsite campaigner Sarah said ‘The atmosphere here is really positive with the action looking to carry on throughout the day’. 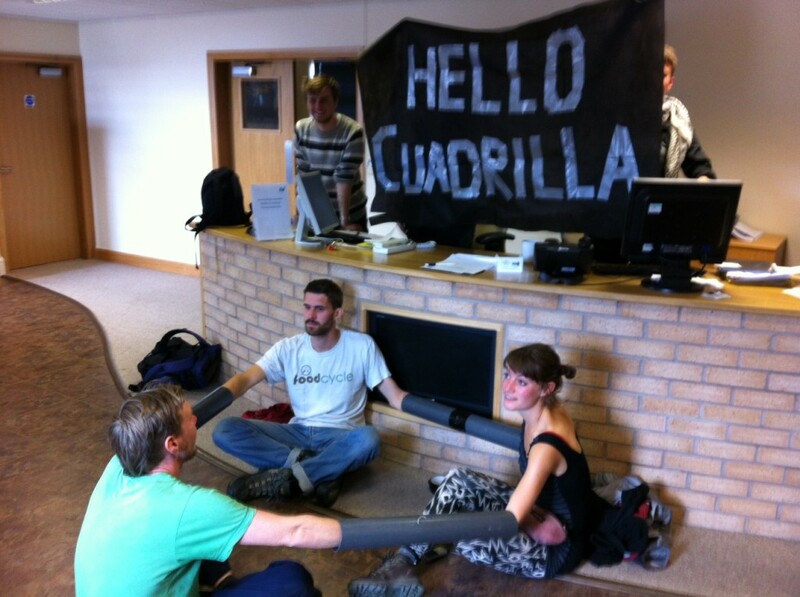 The blockade at IGas ended peacefully at 13:00 and the activists have now joined those still at DEFRA. 3. Lock-on at Crawberry Hill, liv fracking site: At Crawberry Hill, East Yorkshire, campaigners occupied and shut down a new drilling site operated by Rathlin Energy. 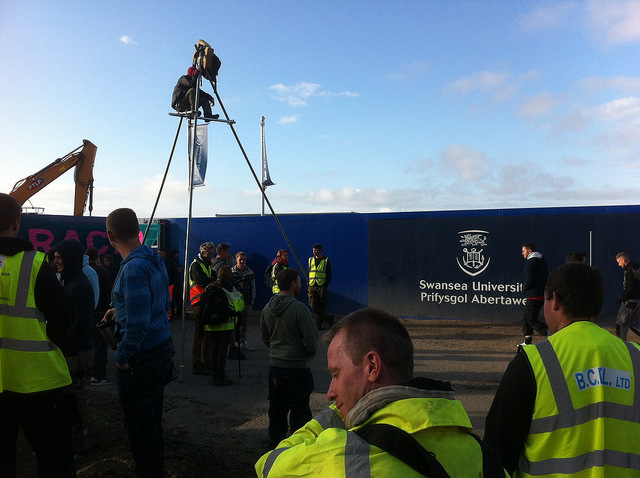 At 8:40 protestors entered and locked themselves to the fence, alongside a large banner which reads ‘Rathlin Energy: Safety Fail’. Activists were met with brutal and disproportionate force by the local security guards, in one case pulling an older woman with so much force that they grabbed her shirt and exposed her body. 6. 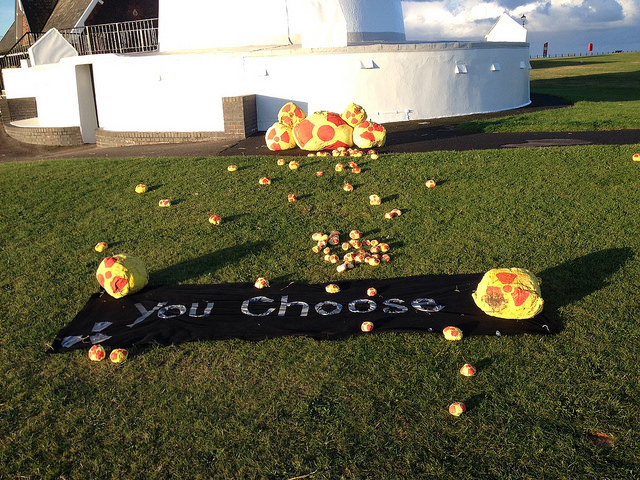 Radioactive Response: At 6.45am, a number of families and their children placed 88 ‘atoms’ of Radium around Lytham as a temporary art installation to highlight concerns about negative impacts of fracking on public health and the environment from radioactive discharge. Radium is just one of the radioactive materials released from the earth when it is fractured in the fracking process. The “atoms” will be placed around Lytham and each one will have a message attached with the website www.frack-off.org.uk guiding the public to all the latest research. The atoms are made entirely from biodegradable materials. 7 + 8. Banner hanging in Salford and Blackpool College: Anti-fracking campaigners from Salford hung a banner from a bridge at Salford Media City. 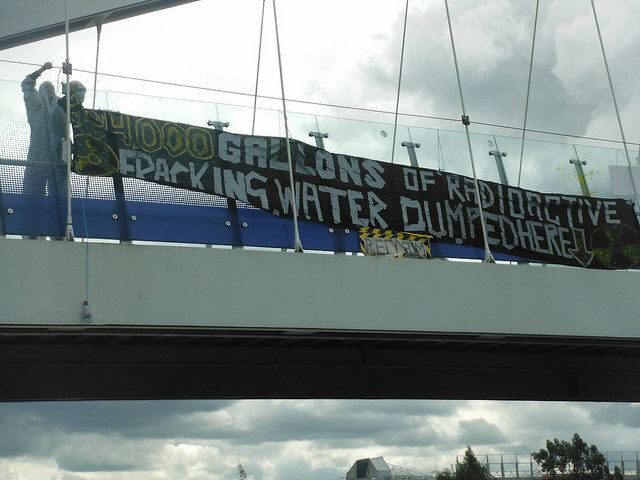 The banner states that 884,000 gallons of radioactive fracking water has been dumped into the Manchester Ship Canal. Local campaigner Louise Carr said “The Environment Agency allowed United Utilities to dilute the water and put it into our canal. 884,000 gallons of radioactive and toxic water from just one fracking operation, which was cut short because the company caused two earthquakes in the space of six weeks”. A banner was also hung at Blackpool College who have accepted donations from Cuadrilla. 9. 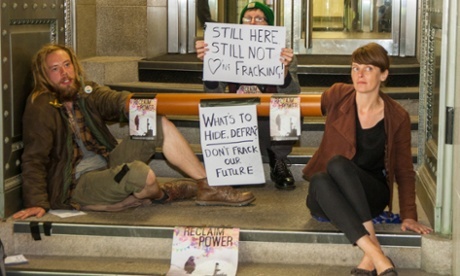 Visits to local councillors: At 7:50am a group of anti-fracking campaigners from the Reclaim the Power camp in Blackpool visited the homes of local councillors with vested interests in supporting fracking in Lancashire. 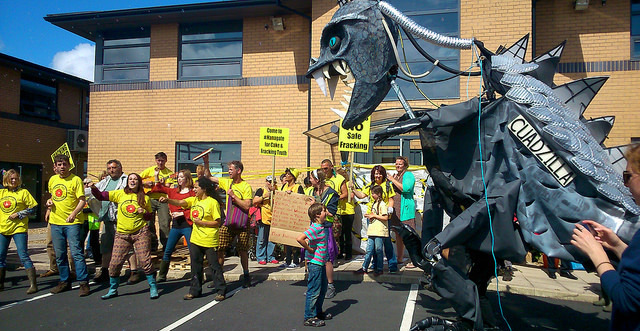 The group set up a demonstration highlighting how noisy, loud and disruptive fracking would be for local residents. 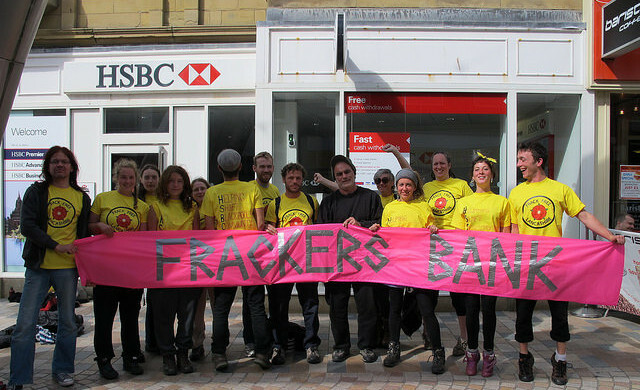 Their banners read: “Corrupt councillor”, “Reclaim the power”, “Frack free families” and “Frack off”. 10. Fraxtons: Down the road in Preston, a group of activisits posed as a spoof fracking insurance company – ‘the only company promising to offer insurance to homes in a fracking area.’ The theatrical street presence drew attention to the impacts of fracking on house prices and home insurance. 11. 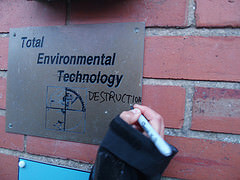 Superglue action at Total Environment Technology: At 8:00 a separate group of activists visited Total Environmental Technology premises outside of Hull in East Yorkshire. A haulage company used by Cuadrilla and the fracking industry, Total Environmental Technology lorries are currently being used to remove waste and used fracking chemicals – “frack fluids” – from live sites. Approximately 2-300 lorry-loads of waste are created per frack from each well.(7). The activists, including Yorkshire locals, glued the doors closed in order to shut down the site. 12. HSBC die-in: At 14:30, thirteen activists staged a “die-in” at the Birley Street branch of HSBC in Blackpool, where they raised banners displaying the phrases “Fracker’s Bank” and “Toxic Investors”. Demonstrators played drilling sounds to represent the hydraulic fracturing process of fracking, and spoke to both customers and passers-by about the dangers of extreme energy extraction. 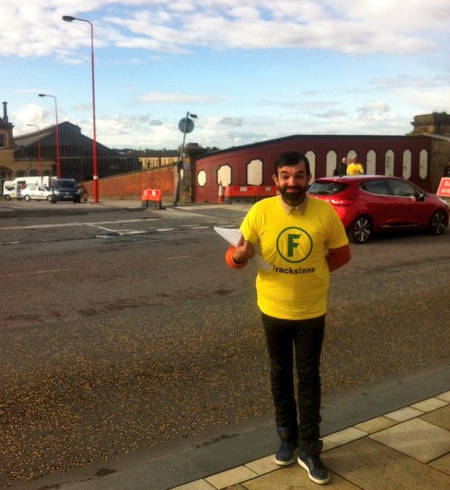 Their t-shirts were emblazoned with their very own “HSBC” slogan: “Helping Shaft Blackpool’s Community”. Public response to the action was overwhelmingly positive, with many people expressing agreement about the need to stop fracking. 13. Blockade at PPS, Cuadrilla’s PR company: Six protesters dressed in toxic hazard suits talked to to passers-by and office workers who share the PPS building about the environmental dangers of fracking, fuel poverty, and the government’s recent report, showing that a reliance on fossil fuels would lead to a rise in domestic fuel bills over the next four decades, in contrast to a focus on sustainable energy, which would lead to lower bills. They held banners displaying a range of slogans: “PPS: It’s a Fracking Whitewash”, “Community Support Manufactured On Demand”, “Toxic Waste Disappears Beneath Your Shoes” and “Taking The PPS”. PPS have been accused of bugging private council meetings, forging letters from residents in support of developments and using “trickery, deceit and manipulation” to secure planning permissions. PPS was awarded the PR Week award for Issues and Crisis management for supporting Cuadrilla following the earthquakes caused by their exploratory shale gas drilling in the Blackpool area in 2011. Babs Murphy is at the head of both the North West Energy Task Force – funded by Cuadrilla Resources and Centrica Energy – as well as head of the North and West Chamber of Commerce.